What does a hop-happy brewery get themselves for their ninth anniversary? A nine-megaton hop bomb that outdoes last year’s anniversary explosion of hops. 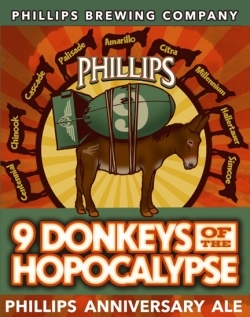 Following in the footsteps of Phillips Crazy 8s Annu-ale, we’re happy to announce the coming of the 9 Donkeys of the Hopocalypse. “9 Donkeys?” you say? Well, the number nine refers not only to the different hops used in this perilous 9% brew (Amarillo, Cascade, Centennial, Chinook, Citra, Hallertauer, Millenium, Palisade and Simcoe), but also to our ninth year of brewing and the Hopocalypse detonation level. The donkey part, well, we’re not sure exactly, but there sure are a few asses around the Phillips epicentre. 9 Donkeys of the Hopocalypse is available in 650ml bottles at at the brewery and select cold beer stores. A small amount has also been set aside for draught accounts, and for growlers at the brewery.